Apple (s aapl) just released iOS 4.3.2 for iPhone, iPad and iPod touch devices. The update includes various bug fixes and improvements, including the resolution of the FaceTime random image capture bug, and an a fix for problems some international users were having connecting to 3G networks on the iPad. 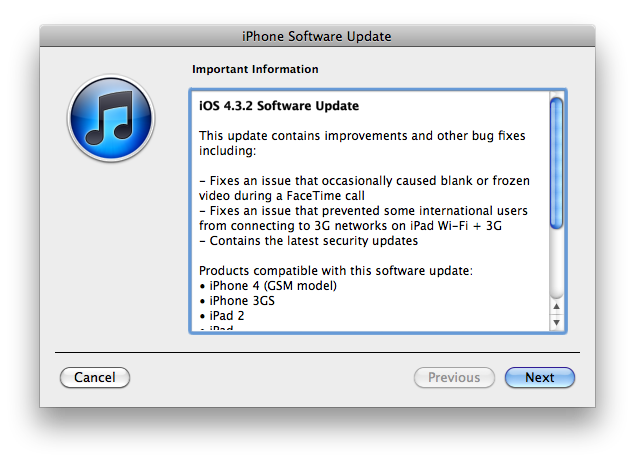 iOS 4.2.7, boasting the same fixes, is also available for Verizon (s vz) iPhone 4 owners. The update, which was reported to be arriving sometime within two weeks from April 7 by BGR, is also rumored to possibly bring fixes for roaming issues some Verizon iPad 2 owners are experiencing, but Apple makes no mention of the problem in its update notes for iOS 4.3.2. The updates are compatible with the iPad, iPad 2, iPhone 3GS and 4 and the 3rd and 4th gen iPod touch. If you’re installing these updates today, please let us know in the comments how the new software is working out for you, and if you’re a Verizon iPad owner experiencing the roaming bug, whether or not 4.3.2 provides a fix. Yep, same problem as darren. Apps dont open, calls dropping frequently. I never had any of these issues before I installed the upgrade. This is the first time Ive upgraded too. i updated and now aps do not open. call apple support go through the prompts and phone just rings….no help or resolution yet!! !